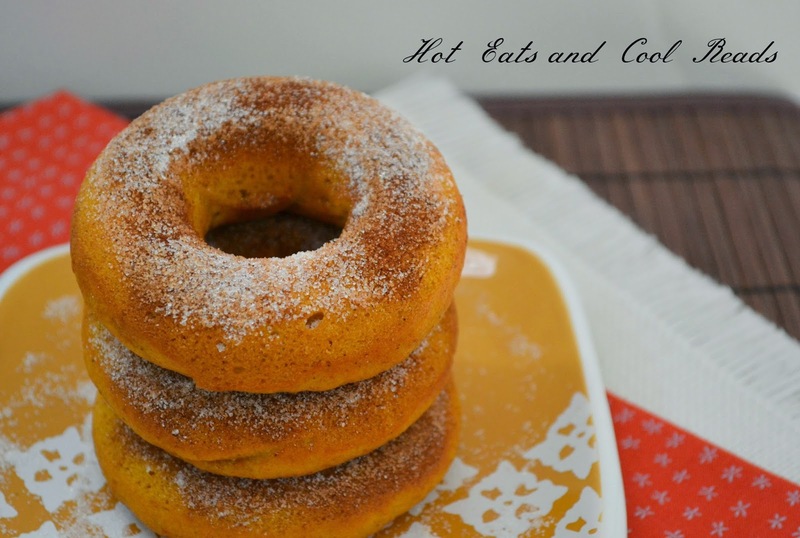 These easy and delicious donuts are perfect for fall! Top them with cinnamon and sugar for a sweet breakfast, snack or dessert! As soon as cooler temps and fall rolls in, it's always time for pumpkin recipes! 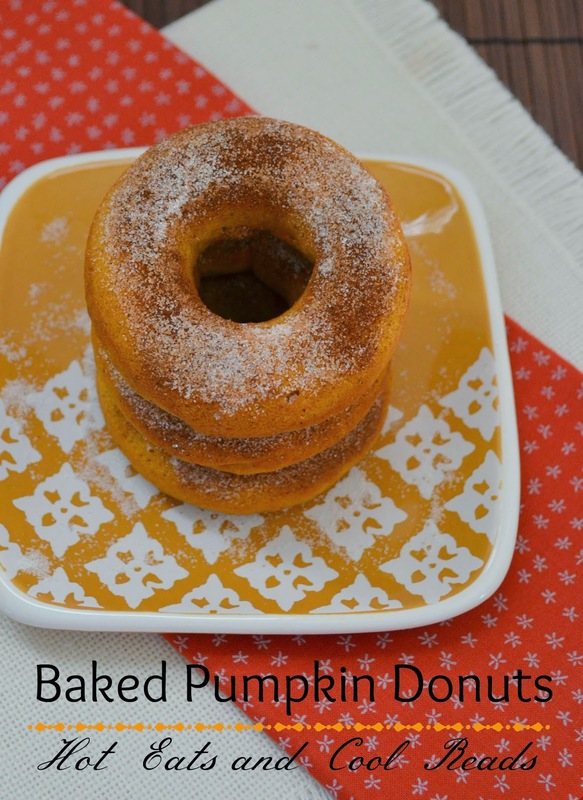 I bought a donut pan a few months back, and finally decided to use it with this amazing pumpkin donut recipe! These are too easy to make, and are a little healthier for you than the fried version! You could make them ahead of time, and eat them for breakfast during the week. Not saying they will last that long, since they are so good, but it's the thought that counts! They go perfect with a huge mug of chai tea! Check out some of my other favorite fall recipes: Homemade Cinnamon Coffee Creamer, Sparkling Apple Cider Float, Pumpkin Pie Spice Rice Pudding, Apple Cinnamon Cake with Cinnamon Cream Cheese Frosting, Apple and Pear Crisp, Slow Cooker Brown Sugar Sausage, Apples and Onions, and Cranberry Orange Sparkling Wine Cocktail! Click the recipe title to stop by and check them out! In a bowl, mix together the oil, eggs, sugar, pumpkin, pumpkin pie spice, salt and baking powder until well combined. Stir in the flour until combined and smooth. Scoop half the batter into a gallon ziploc bag, seal and snip off the corner. Pipe the batter into each donut section, and fill 3/4 full. Bake for 18 minutes, remove from pan and sprinkle with cinnamon sugar. Repeat with remaining batter. Store in a sealed container once cooled. Pinning to my donut board! These donuts look and sound fall perfect! :) Pinned. Why can't donut shops sell beauties like these! I guess I'll have to make these. YUM! I was eyeing these up the other day when you posted them on FB. They look delicious! and I love that they are baked. I bought a donut pan a long time ago and have yet to use it. This just may make me pull it out soon! I love love love baked donuts! The cake like texture is so much more appealing to me than the fried dough. These look soooo yummmy Sheena! Mmmm, so good. And I love the idea that they are healthy. Or at least healthier. Haha, any excuse for me to eat donuts for breakfast. I've never made donuts before and they are way easier than I thought. these might just have to be the first ones I make - they look delicious! I love my donut baking pan :) I also love your pumpkin donuts! I got me a donut pan...whoop. Gonna be making these soon! !